LETHBRIDGE, Alta. – Kevin Koe is known more for his spectacular doubles and run-backs but Saturday night he needed perfect draw weight to give Canada a heart-stopping 6-5, extra end victory over Peter de Cruz of Switzerland to give himself a shot at a third world championship title. LETHBRIDGE, Alta. 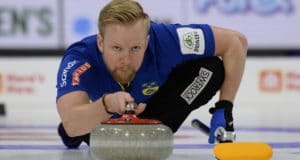 – Defending world men’s curling champion Niklas Edin of Sweden moved one step closer to a record-tying fourth title Saturday at the ENMAX Centre with an impressive 8-2 semifinal win over Yuta Matsumura of Japan. LETHBRIDGE, Alta. – Playing one of their best overall games of the event, Kevin Koe and Team Canada beat Bruce Mouat of Scotland 6-5 in Saturday morning’s playoff qualification game to move on to tonight’s semifinal of the Pioneer Hi-Bred World Men’s Curling Championship, presented by Service Experts, Heating, Air Conditioning, Plumbing. 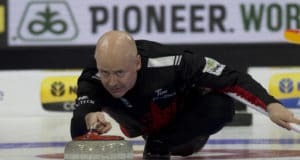 LETHBRIDGE, Alta – Kevin Koe and Team Canada finished third in the round-robin portion of Pioneer Hi-Bred World Men’s Curling Championship, presented by Service Experts, Heating, Air Conditioning, Plumbing and will face Scotland in one of Saturday morning’s qualification playoff games. LETHBRIDGE, Alta. 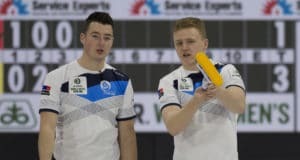 – It was a struggle after their sluggish start, but Bruce Mouat and his youthful Scotland lads have climbed back into playoff contention at the Pioneer Hi-Bred World Men’s Curling Championship, presented by Service Experts, Heating, Air Conditioning and Plumbing. LETHBRIDGE, Alta. – Kevin Koe of Canada (8-3) leaped into a 7-0 lead after two ends and went on to a 10-3 win over Peter de Cruz of Switzerland (8-3) to climb into a tie for second place at the Pioneer Hi-Bred World Men’s Curling Championship, presented by Service Experts, Heating, Air Conditioning and Plumbing. LETHBRIDGE, Alta. 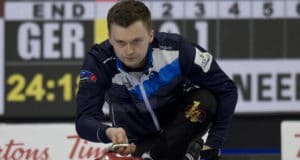 – Bruce Mouat of Scotland came into the world men’s curling championship as one of the pre-event favourites, but it wasn’t until Thursday that they showed why his team was so highly rated. LETHBRIDGE, Alta. – Peter de Cruz of Switzerland (8-2) scored a single in an extra end Thursday to beat Yuta Matsumura of Japan (8-2) 6-5 and leave defending champion Niklas Edin of Sweden (9-1) alone atop the standings at the Pioneer Hi-Bred World Men’s Curling Championship, presented by Service Experts, Heating, Air Conditioning and Plumbing. LETHBRIDGE, Alta. – Kevin Koe brought the fans to their feet and Team United States to its knees Thursday morning with one of his patented, spectacular in-offs to secure Canada’s 6-3 win over John Shuster of the U.S. at the Pioneer Hi-Bred World Men’s Curling Championship, presented by Service Experts Heating, Air Conditioning and Plumbing. LETHBRIDGE, Alta. 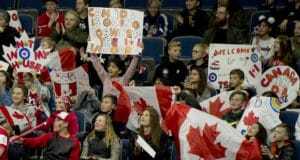 – Hump day was a bad day for Kevin Koe and Team Canada as they lost both their games at the Pioneer Hi-Bred World Men’s Curling Championship, presented by Service Experts, Heating, Air Conditioning and Plumbing. LETHBRIDGE, Alta. 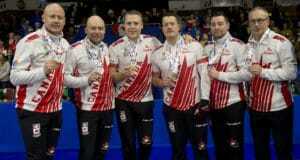 – Peter de Cruz and Team Switzerland cracked a record-tying six-ender on their way to an 11-2 win over SooHyuk Kim of South Korea (0-8) to earn a share of top spot Wednesday at the Pioneer Hi-Bred World Men’s Curling Championship, presented by Service Experts Heating, Air Conditioning and Plumbing. LETHBRIDGE, Alta. – There are no longer any unbeaten teams at the Pioneer Hi-Bred World Men’s Curling Championship, presented by Service Experts Heating, Air Conditioning and Plumbing, and Canada has been replaced atop the standings by Japan. LETHBRIDGE, Alta. – Niklas Edin and Team Sweden (6-1) cracked a pair of three-enders Tuesday evening to beat Peter de Cruz of Switzerland (6-1) 9-4 and reduce the ranks of unbeaten teams at the Pioneer Hi-Bred World Men’s Curling Championship, presented by Service Experts Heating, Air Conditioning and Plumbing to one – Kevin Koe of Canada (6-0), who had the night off.